See Palden's book Power Points in Time - about ancient festivals, lunar phases, planetary line-ups and historic moments. There is also an original 1987 archive version of the book, called Living in Time, available free online. There are identifiable cycles of change in history and a clear relationship between the motions of slower-moving planets and historical events and trends. This book demonstrates this. However, current historical practice and received wisdom disagree. Events and concrete changes in history often have their beginnings in the ideas, experiments and initiatives of people, occurring before the actual event. 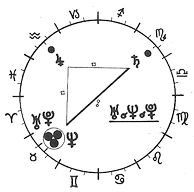 Astrology can identify the times when formative ideas and new trends take shape, and thus shape subsequent history. Human free-will certainly does play an enormous role in historical events, yet it operates within the context of the nature of the times and the quirks or constraints of the 'energy-weather' at any time. An astrological study of history isn't about 'fate' or determinism in history; instead it reveals an interaction between changing energy-conditions and our human responses to evolving situations. A study of astrological history shows the many ways that this process works. It describes the inner nature of the times, and the threads and tides underlying events. and the deeper psychological processes lying behind it. May this journey into the essence of historical time and change contribute to a wider and deeper understanding of world history. This is important, since we now live in a century of choice. Big choice. This is the consequence not necessarily of astrological cycles or influences: it is a consequence of humanity's accumulated actions and choices to this day, within the context of those astrological influences. Over time we have made the choices we've made, and today the scope of our choice is accentuated enormously since the accumulated consequences are now with us more than ever before. A note to astrologers without historical training: it is easy to cherry-pick and interpret events to fit one's astrological theories and predilections. A wider understanding of historical events is needed. The best way to do this is to study the history first, picking events considered to be significant, and only then to put it alongside the astrological data. Astrological motions don't always create the outcomes that astrological theory expects; on a Mars conjunct Pluto, it's just as likely that peace or war could break out - the 'god of war' has many tricks up his sleeves. A note to historians with no astrological training: conventional history asserts that there is no inherent system or pattern to history. Therefore positing a 'theory of history' involving astrology can only be bunkum. This standpoint will one day change, and astrological theory will prove useful in informing a new understanding of world historical processes. This particularly concerns the largely unconscious psychological dynamics that hide behind historical events. A note to astrologer-historians. You will enjoy this ephemeris. There's a lot here for you. Good luck! This research was done in 1988-93 (in UK, USA and New Zealand), with slight revisions in 1999 and 2012. Sig Lonegren, once of Vermont USA, now in Glastonbury, England, a dowser and prehistorian who practically encouraged this astrologer in his work. May the Historical Ephemeris give you endless hours of fascination! The Historical Ephemeris is no longer available in print. For technical reasons (screen size) it cannot become an e-book or mobile-friendly online book. This Historical Ephemeris may be printed out for personal use and study - the PDF versions of the historical timelines are recommended! See on the right. Each period covers one Neptune-Pluto cycle of 495ish years, covered in two tables each cycle. Each table is thus 250ish years long. In a sense the beginning of recorded history. This is why this ephemeris starts at 600 BCE. The Historical Ephemeris is available at no charge in a spirit of knowledge-sharing. It may be printed out for research, study and discussion, in single copies only. All other forms of reproduction online and in print, apart from fair-play extracts and quotations, require permission of the author, Palden Jenkins. PRINTING. Look for PRINT PDF at the top-right of each timeline page. Other pages can be printed straight from the web-page.